On these dates we’ll see the closest conjunction of three prominent celestial objects: Saturn, Mars, and Antares. They’ll be the brightest objects in the SSW right after sunset, but move to the west and downward as the evening progresses. Your best view would be around 1-2 hours after sunset. 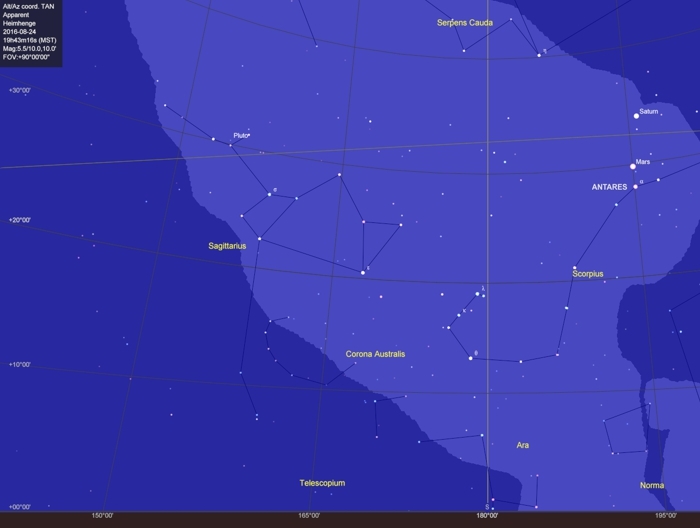 If you want a larger sky chart, just click on the one above. The planets drift east and west with respect to the stars over time. So every once in a while, some of them can get fairly close to each other in the sky. That’s what we call a conjunction. They can actually overlap, but that’s extremely rare. If they pass within a Moon-diameter (0.5°) it’s considered a “close” conjunction. In this triple conjunction, Saturn will be about 4° above Mars, and Mars will be about 2° above Antares. That’s not real close as far as conjunctions go, but all three objects will be bright — their magnitudes are +0.4, -0.4, and +1.1 respectively. They will be at their closest on the dates given above, but will hang out in the same general area for a few weeks. An additional effect you can observe is how stars twinkle more than planets. I did a post about that back in 2012, and it includes a video of a star twinkling. Check it out. Then go outside and check out Mars and Antares with your own eyes — they’re about the same reddish color and brightness, but Mars shines with a steadier beam of light. You’ll see it now that you know what to look for. Saturn, between Mars and Antares in brightness, will also shine with a steadier light. It’s color is often compared to “straw” or “pale gold.” Through binoculars, you should just be able to make out Saturn’s rings. Mars will show a small mottled disk. Antares will just be a sparkling point of light.